As graduate students in the UC Berkeley School of Public Health, we’re surrounded every day by our colleagues - members of a new wave of health workforce. Training this new wave of individuals has never been more important; it is projected that, in order to meet increased demand due to the aging and growing population, as well as retiring workforce, California’s health care system will need almost 500,000 additional workers by 2020. There is not only a need for additional, trained health workforce members, but also a need to ensure that this new workforce is racially/ethnically representative of the larger population. This is crucial for providing culturally appropriate services that address health issues facing our diverse populations. In California and more broadly in the United States, African Americans and Latinos are underrepresented in health professions, specifically doctors, nurses, pharmacists, and dentists. The participation of men of color - and in particular, African American and Latino men - has been a prominent health workforce issue. (Men represent about a quarter of the health workforce.) This has dovetailed with the attention on addressing the poorer health, educational, and employment outcomes that boys and young men of color, as compared to their White peers, experience. In 2014, the Greenlining Institute issued a report about potential strategies to combat barriers that these groups face in pursuing health careers. Other ongoing initiatives include the African American Male Achievement Initiative in Oakland, the Alliance for Boys and Men of Color spearheaded by PolicyLink at the state level, and President Obama’s My Brother’s Keeper initiative. Thus, increasing the engagement and retention of boys and young men of color in health professions is a relevant and timely strategy to increase the academic, career, and life opportunities for young people, and particularly men, of color. Our year-long PLUS project has focused on strengthening this pipeline of health professionals of color. 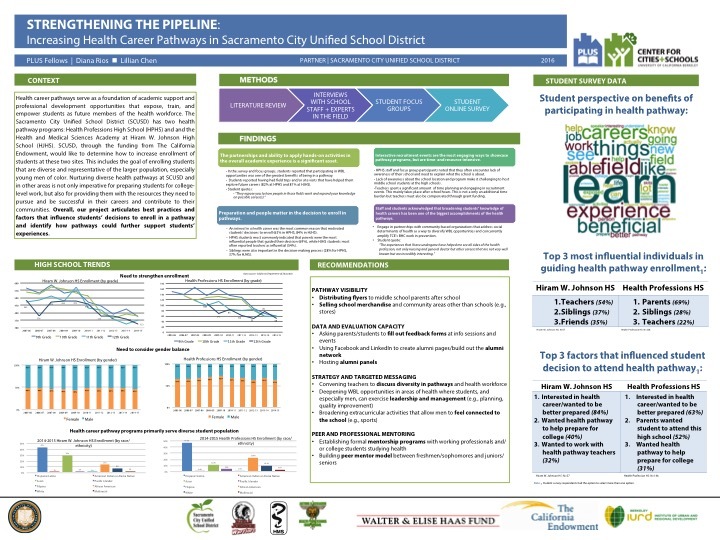 Since fall 2015, we have been working with the Sacramento Unified School District (SCUSD) to determine how to increase enrollment of students in their health pathway programs. This includes the goal of enrolling students that are diverse and representative of the larger population, especially young men of color. SCUSD has two health pathway programs: Health Professions High School (HPHS) and the Health and Medical Sciences Academy at Hiram W. Johnson High School (HJHS). These pathways aim to expose students to the health and medical field through relevant, rigorous coursework and work-based learning opportunities. For young men of color and underrepresented populations, this pipeline aims to be a foundation of academic support and professional development opportunities that expose, train, and empower them as future members of the health workforce and contributors to their communities. Several key considerations in recruiting and meaningfully engaging of men of color in health pathways include (1) the reframing of health careers as opportunities to lead and to give back to their community, (2) utilizing peers to foster a sense of belonging, (3) having extracurricular opportunities that connect them to their school community, and (4) ensuring that they, and other underrepresented students, have sufficient academic and emotional support to succeed and persist in pathways. Working on this project has been a rewarding experience because of its implications for the two schools, the district, and the broader health workforce. To ensure that our work has lasting and broad impact, we are working with our partner to set aside time to share our findings with other schools and district partners and engage them in a conversation about the implications of our findings. Further research into strategies and best practices that diversify the health workforce pipeline will be valuable and highlights the importance of continuing to evaluate health pathway programs, and pathway programs overall. Thus, we hope that our project will contribute to this conversation. Finally, as two female graduate students that are passionate about equity in public health, we strongly believe in the importance of the work of SCUSD and other health pathways to build the diversity of the future health workforce. While there is certainly more work to be done, it has been encouraging to work with and hear from staff and students at HJHS and HPHS about the interest in health careers and different activities that expose students to the health field. We’re truly excited to welcome these incoming peers and leaders to join us in the health workforce. Lillian Chen (left) is a first-year Master of Public Policy and Master of Public Health candidate with primary interests in health policy and social policy. After graduating from UC Berkeley in 2011 with a B.A. in Public Health, she worked at a social sector research and consulting firm. 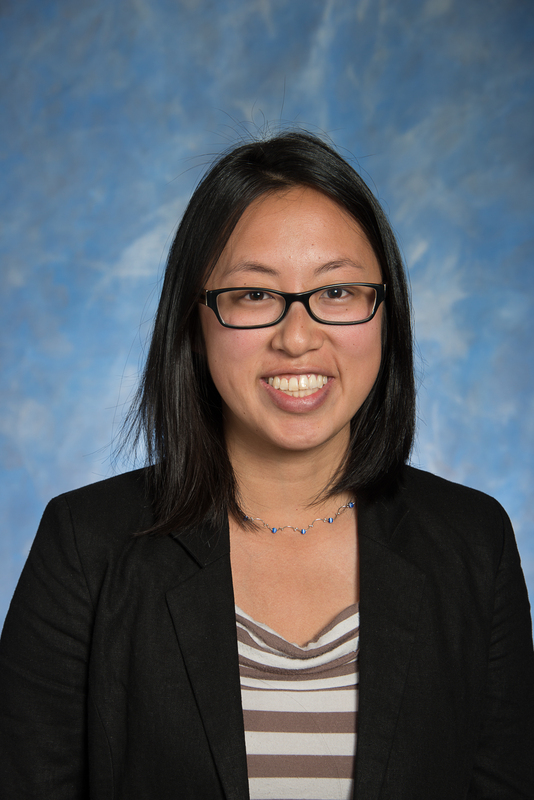 Lillian has long-term interest in social and structural determinants of health. She is excited to explore more of those issues through the PLUS program, especially as they relate to cross-sector and city-school collaboration in education to build healthy communities. 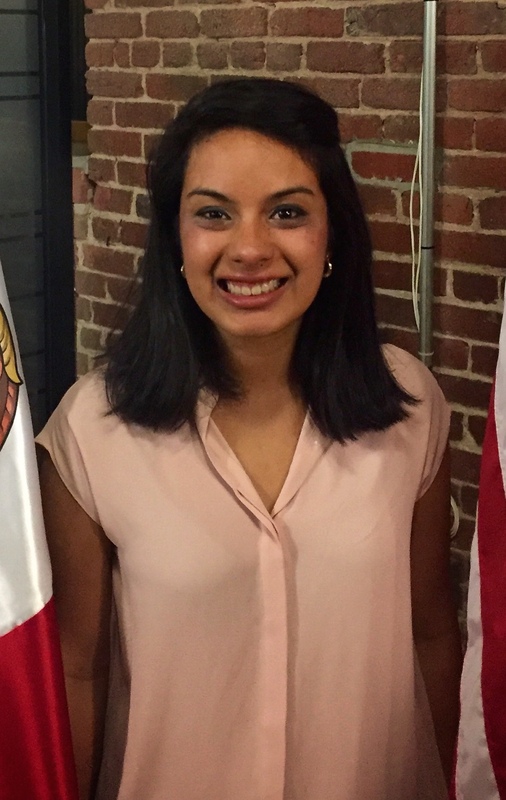 Diana Rios (right) is a first-year Master of Public Health candidate in the health policy and management discipline at UC Berkeley. Her academic interests include global health systems and working on health policies that enable communities to live healthy lifestyles. She worked as an Analyst at Mission Analytics Group where she provided technical assistance for long-term care projects under the direction of the Centers of Medicare and Medicaid. Join us for the Y-PLAN Japan 5th anniversary celebration!